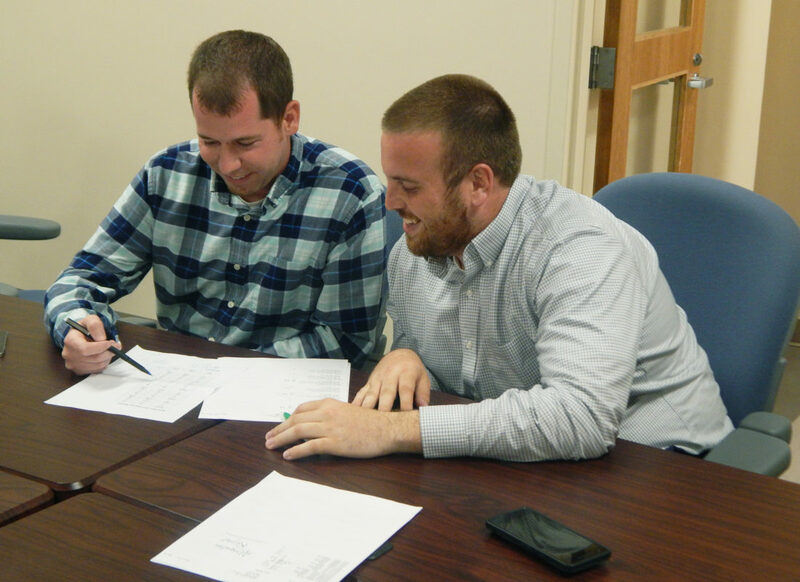 PHOTO BY JIMMY FLINT Tiffin Assistant Engineer Matt Watson (left) and Seneca Industrial and Economic Development Corp. Development Manager Bryce Riggs look over election results Tuesday night at Seneca County Board of Elections. Tiffin voters approved a five-year, 0.25-percent income tax levy Tuesday night for roads and bridges that represents the first income tax increase for the city in 32 years. According to unofficial results that include absentee and Election Day ballots but not provisional ballots, 1,413 people, or about 54.4 percent of voters, approved the levy. The increase, which moves the income tax rate to 2 percent, takes effect Jan. 1. The increase is to generate $1.3 million-$1.5 million annually and is to cost people who work in Tiffin an additional $1 for every $400 earned. The levy was rejected by about 52.7 percent of voters in November. The city’s income tax had not been increased since it moved from 1 percent to 1.75 percent in 1986. Bryce Riggs, development manager for Seneca Industrial and Economic Development Corp., who helped on the Citizens for Tiffin 2018 committee that supported the levy, said he was excited about the passage. “The momentum continues in our community,” he said. Riggs credited residents on the committee for their hard work in informing citizens about the levy. He said the committee was the difference in getting the measure approved this time. Riggs also credited Tiffin Assistant Engineer Matt Watson for going door-to-door and developing data that showed the need for the levy. Watson thanked the committee and credited the support of city council and city administration for getting the levy approved. He said the funding will be important in improving the condition of Tiffin roads and bridges. “We will be paving two-and-a-half times more roads next year,” he said. Watson said he hopes the city can prove to those who did not support the increase that it is worth it. Tiffin Mayor Aaron Montz also thanked voters. Watson said without grant funding, the city typically budgets about $400,000 a year to repave some of the 89 miles of roads. About $100,000 of the budget goes to ensuring curb ramps are compliant with the Americans with Disabilities Act. Watson said at that rate, it would take about 40 years to repave every city street. Watson said Tiffin historically has spent less on paving than many neighboring cities. He said based on funding figures, Bucyrus takes about 12 years to repave 89 miles of road and Mansfield takes about 12.5 years to repave 321 miles of road. Council agreed earlier this year that if the levy was approved, about $400,000 of what is raised annually would go to improve bridges. The decision was reached because Watson said the Ella Street Bridge needed to be replaced soon, possibly in the next five years. Watson said the bridge, which was built in 1914, has experienced “major” deterioration. If work is not done soon, weight limits or closure may be implemented. Replacement cost could be about $5.5 million. City officials hope the money raised by the tax increase can be leveraged to obtain loans or grants. Watson said about $1 million left each year for roads should be enough to get the city back on a cycle of repaving roads every 15-20 years. He said the useful life of a repaved road is about 15 years.